« WO FAT – TO TOUR IN JUNE! 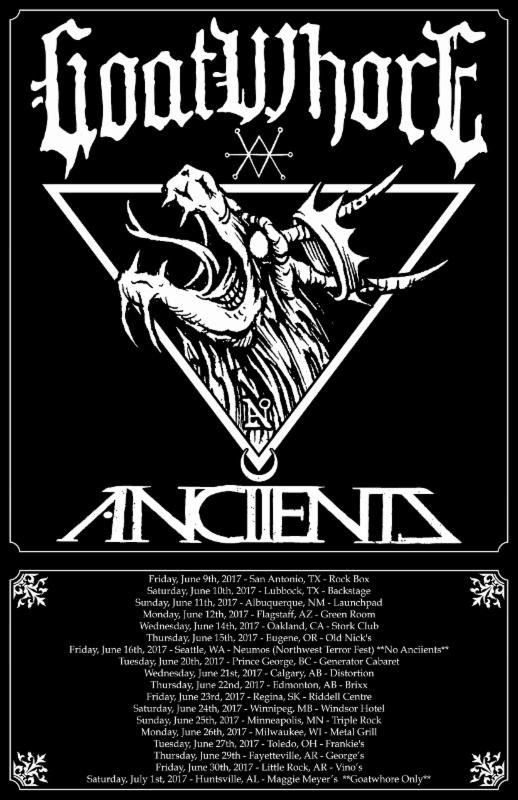 GOATWHORE will release their anticipated Vengeful Ascension full-length worldwide on June 23rd via Metal Blade Records. The band’s seventh full-length and second recorded reel-to-reel, Vengeful Ascension was captured at Earth Analog in Tolono, Illinois near Champaign with longtime soundman and comrade Jarrett Pritchard (1349, Gruesome). The ten-track, forty-one-minute production – mixed by Chris Common (Tribulation, Pelican) and mastered by Maor Applebaum (Faith No More, Halford, Today Is The Day) – marches in, clutches its listeners by the throat and refuses to loosen its grip until the abrupt conclusion of “Those Who Denied God’s Will.” A sonic manifestation of war, chaos, desolation, and emotional conflict, seamlessly bridging twenty years of the band’s signature brand of audio venom, it’s a record that finds its members at their most accomplished both individually and as a cohesive unit. Guitarist Sammy Duet‘s dense, sub nuclear riff work and possessed solo blitzes are at their most devastating spiraling flawlessly and instinctively around drummer Zack Simmons‘ and bassist James Harvey‘s hammering rhythms while vocalist Ben Falgoust‘s distinctly commanding roar, his acidic prose more enunciated than ever before, complimenting the apocalyptic proceedings. Vengeful Ascension will be available on CD, vinyl (in multiple limited color variations), and digital formats. Various Vengeful Ascension preorder options are currently available at metalblade.com/goatwhore where you can also sample the record’s title track. This entry was posted on May 21, 2017 at 1:14 pm and is filed under Hard Rock, Heavy Metal, Metal, Music, news, rock music, world news with tags goatwhore, Heavy Metal, metal albums 2017, metal odyssey. You can follow any responses to this entry through the RSS 2.0 feed. You can leave a response, or trackback from your own site.